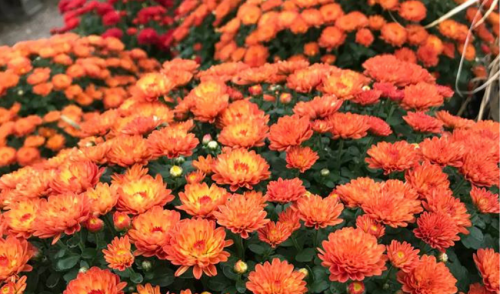 Share "Winter Your Fall Mums"
Chrysanthemums are one of the most beautiful blooming plants in your fall garden, coming in a variety of colors and shapes. Many of you have tried to plant them in your gardens, some successfully, others not. Here's a few reasons why they might not have worked for you. Mums that come from a floral shop or box store aren't always the hardiest of varieties for our cold winters. Garden Centers try to have the most vigorous varieties available, but even then, we sometimes have problems. These plants are shallowly rooted, so open winters with no snow cover can be a problem. We recommend you DO NOT cut the mums back in the fall, leave the top growth on for winter protection and then cut them back in the spring. You can even throw some leaves or straw over the tops, once the plant is completely died down and brown. Try to avoid the temptation to cut them back too early in the spring, probably not before the end of April in our area. Removing the protective coverings too early in the spring can result in die back from a late spring frost. Another factor is moisture. Since the plants are shallowly rooted, it means they dry out very quickly. The perfect situation would be a 2' blanket of snow that would remain over the top the entire winter, but we know that doesn't happen often on the windy prairie. Exposed plants dry out very quickly, so it is important to make sure the ground freezes up wet in the fall. We recommend an inch of water per week up until the ground (not air temperature) is frozen. You can apply a dose of an organic fertilizer like our favorite, Plant Tone, in the fall. This will build up the root system for next season. If you need to transplant or want to divide your mums (and share the beauty) we recommend doing that process in the spring, just when the green tips start to emerge from the ground.